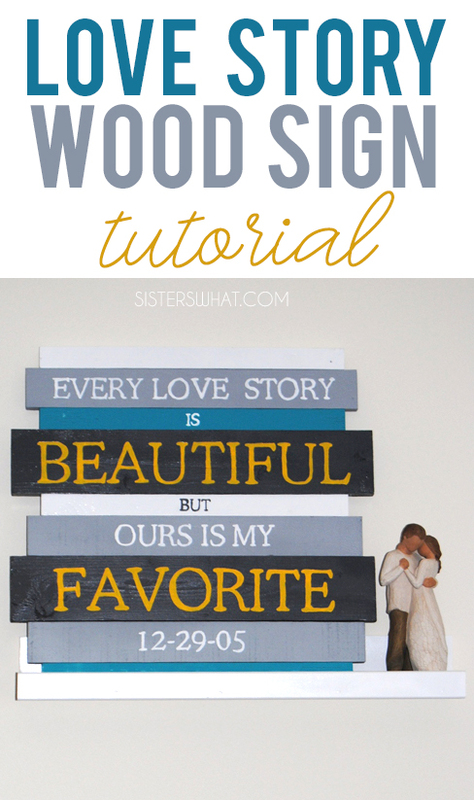 ' Love Story Sign Tutorial - Sisters, What! 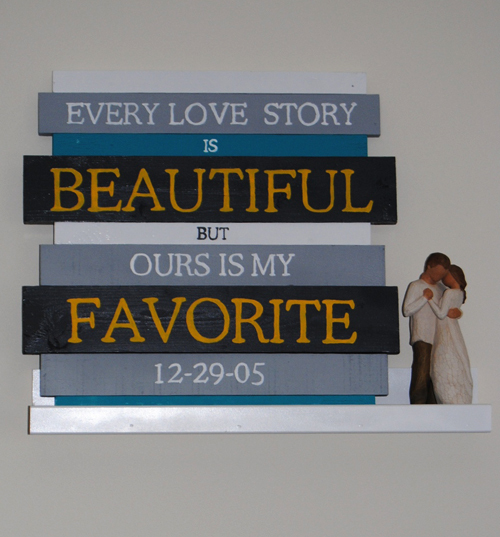 Today my friend Jamie (from Burch Lane Designs Shops) will be our guest showing us how to make this lovely sign. Such a great way to display for such a beautiful quote. I seriously want to make one now. But I made a few changes so I will share those with you. - Here are the dimensions of the wood I used: 4 pieces 17 x 1 ¼, 3 pieces 18 ½ x 2 ¼, 2 pieces 20 x 3 ½. My finished height is about 18 ¾. As you can see in the picture below, my boards are different heights which I liked, it just gives it a little texture. I also had him cut me a board slightly smaller than 18 ¾ and one about 15 inches wide to attach all my boards to. Here are the steps I used to put it all together. - First, I laid out all my boards and numbered the back of them so I knew what order to put them in. - Second, I decided what colors I wanted each board to be and wrote that down so I wouldn’t forget (I knew this project would take me a few weeks to complete because of time constraints so I really didn’t want to forget anything). - Third, I painted my boards. I used spray paint, but if I were to do it over I would probably just use acrylic paints because I started mine at my parent’s house around Christmas and got the first layer of spray paint on then when I took it home it was just too cold to go outside and finish so I didn’t get it done until February. I guess you could just use whatever paint you prefer. - Fourth, I added my words. I found a font I liked in word (in case you want to know I used Cooper Lt BT) and made some word boxes about the size of my boards then printed them and cut out the boxes. I laid them on top of my boards and made sure they were the right size. - Then I followed this tutorial to get my letters onto the board: http://homespunhappenings-tammy.blogspot.co.uk/2012/04/i-made-sign.html but instead of coloring mine in with a sharpie I used acrylic paints and a little brush and painted my letters in. - Last, I used Gorilla wood glue and glued my planks to my back board. I started with the bottom one and made it flush with the bottom of my back board and then just moved up from there. Let it dry for at least 24 hours if not more before you move it to make sure you don’t accidentally pull a board off. It’s kind of heavy, but you could probably add a couple or brackets to the back and hang it that way. I chose to put mine on a shelf and lean it against the wall. So cute!! I know just where I want to hang it! !